Issues and trends facing international education exchange today include changing demographics, the migration of intellectual capital, proposed funding cuts for Fulbright and other exchange programs, increasing accountability, deregulation, availability of jobs for graduates, immigration and visa restrictions, threats to academic freedom and open expression, the stifling effects of political correctness, theft of intellectual property, foreign donations and underlying influence, and the recent slowing of new foreign student enrollments. 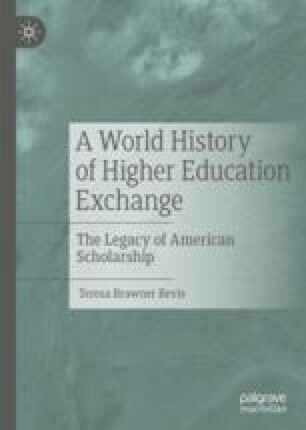 These issues are reviewed alongside commentary and prognostications relating to the future of international higher education exchange, from the Pew Research Center, The Chronicle of Higher Education, Times Higher Education, and others. Allen-Ebrahimian, Bethany, Elias Groll, and Robbie Gramer. 2018. New House Bills Take Aim at Foreign Propaganda. Foreign Policy, March 20. https://foreignpolicy.com/2018/03/20/new-house-bill-takes-aim-at-foreign-propaganda-russia-today-foreign-agent-manafort-fara/. Times Higher Education. 2014. Alarm as Peking Head Replaced with Communist Party Secretary, November 14. http://www.timeshighereducation.com/news/alarm-peking-head-replaced-communist-party-secretary. Wermund, Benjamin. 2018. Enrollment of New Foreign Students at U.S. Colleges Slows again in Trump Era. Politico, November 13. www.politico.com/story/2018/11/13/colleges-foreign-students-trump-985259.